We love the ranch! I’ve toured many “kennels” and never found a place I thought my dog would love. I’m fairly sure my usually shy dog did not want to come home from A to Z dog ranch. The staff was so nice. I was shocked when I picked her up that the staff was able to give me a detailed account of her stay. They knew and remembered the days with my dog. This really tells me that these people love dogs. Wendee and David have really put their lives (and blood, sweat, and tears, too – I’m sure) into making The Ranch a great place for your pets. Why? Because they want to. Because they enjoy it. They aren’t just working for a paycheck, and when it comes to family pets, what more could you want? I trust my dog to A to Z completely. You will not regret doing the same. I love A to Z and so does our 5 year old boxer. He has stayed at the ranch many times over the past three years. 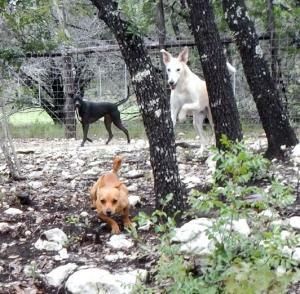 He’s always excited when we get to the ranch and he’s eager to get behind the gate and see his friends. And, he always comes home happy. A neighbor and our vet recommended A to Z to us when we moved to the area. When my daughter’s french bull dog started going to the ranch, Wendee made sure the two dogs “bunked” together which was great. Wendee and her team are committed to providing a healthy, safe and fun environment. They always have the dog’s best interest in mind. I feel confident leaving our “baby” at the ranch because I know he is in very good hands. It was out first time to board our almost 7 year old Bernese Mountain Dog. We tried them out a few months prior to an extended trip that didn’t allow our beloved to travel along with us, so we tried the doggie-daycare first. It went fabulously. I got the “bye Mom” treatment when we arrived the second time. (In a previous city location we dragged him in for a play-day. He seemed so nervous, then we said, “no thanks”, and left.) He had a fantastic time during his 16-day stay. The door to door service was really appreciated. 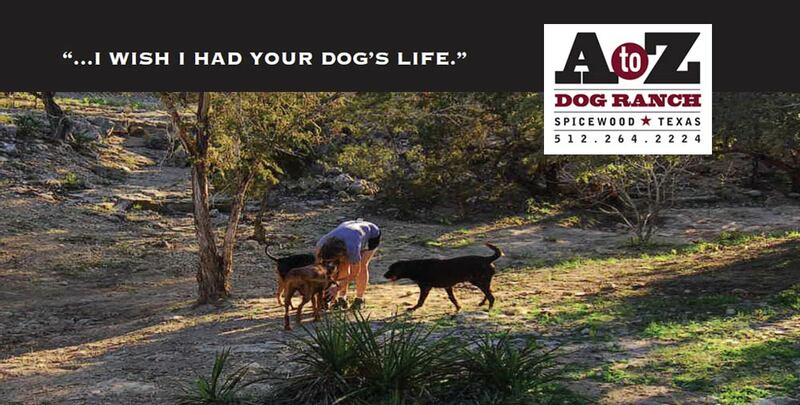 You don’t have to make the trip to Spicewood and it is well worth the additional fee. 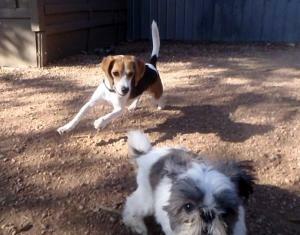 Occasional updates from the doggie-dude ranch was a nice treat for us. I would highly recommend Wendee and her staff. For me, the “bye Mom” treatment is what you want. I love, Love, LOVE this place. We took our dog, Bob, here only two weeks after we adopted him (we went on vacation). I was worried at first, since he was new to our family and wasn’t away from us. Let me just say this, the dog actually became more obedient and better socialized after we picked him up a week later. I’m not sure what Wendee did or the magic formula or aura which surrounds this great place, but I wanna go! Bob and Chuck will be going back. My only regret is that I wish it was closer to us, but I will definitely make the drive just to make my boys happy…and happy they are! They have plenty of room to roam and play and it’s well organized, clean and accommodating for any dog of any size with most any personality. I can go on and on, but people who live in Austin, it’s worth the trip, it’s so much better than another other dog daycare we’ve taken him to in Austin. I have seen many a doggie daycare and my 2 older dogs have adjusted to each new place/new pack as needed in recent years. But A to Z is my idea of what dogs playing SHOULD BE. Room to roam, a safe and clean environment, lots of dogs to play with, humans to love (and supervise when necessary), and fresh air! I love this place so much I want to go hang out there (and have)! I cannot say enough good things about owner Wendee, her contractor husband David, her always dirty but smiling staff (remember, dogs are playing here – humans will get dirty too), and her own pack Addie,Nala,Zeta,Echo, and lovey boy Parker. Plus, Wendee usually has a foster or two that I must meet. My dogs, now 3 of them, look forward to their Saturday play days at A to Z. And many photos confirm it – they each get to do what they love best. Cody (age 5) patrols the perimeter, Zella (age 4) finds the nearest ball or nearest dog with a ball, and Finn (8mos) finds his playmate for the day. And when I do board them, my three stay together and Wendee and her staff easily manage their raw diet. Did I say I think this place is GREAT?!? Check it out.